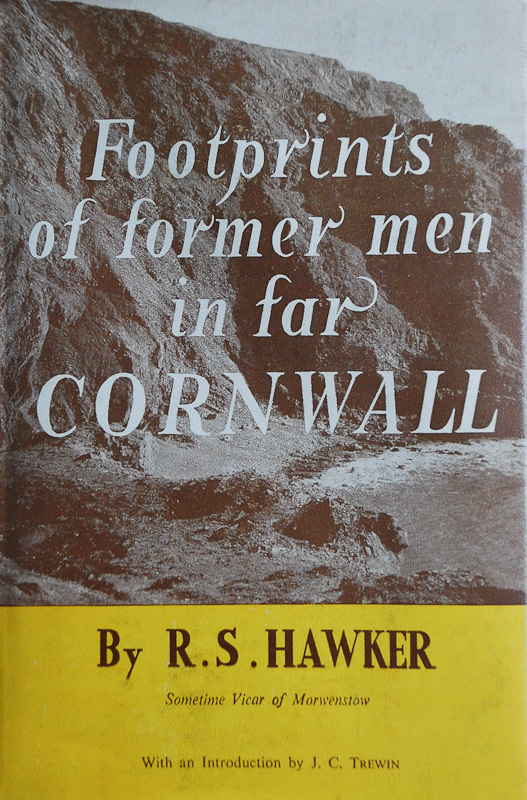 Footprints of Former Men in Far Cornwall, by R. S. Hawker. John Russell Smith, 1870. 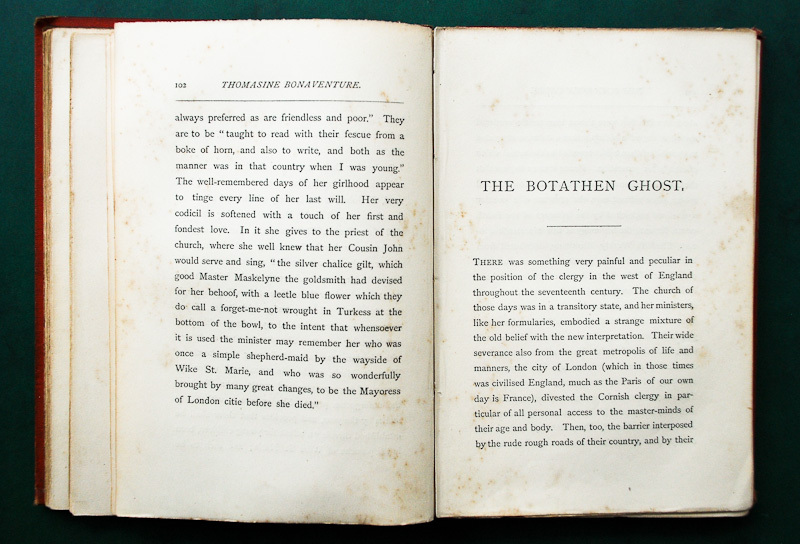 ‘The Botathen Ghost’ is probably Hawker’s best known prose work, having been included in numerous collections of ‘supernatural stories’. It was first published in May 1867 in All The Year Round, a weekly literary magazine edited by Charles Dickens. In 1870 it appeared along with twelve other stories and essays (‘Morwenstow’; ‘Anthony Payne, The Cornish Giant’; ‘Daniel Gumb’s Rock’; ‘Black John’; ‘Thomasine Bonaventure’; ‘Cruel Coppinger’; ‘The Gauger’s Pocket’; ‘The Light of Other Days’; ‘Holacombe’; ‘The Remembrances of a Cornish Vicar’; ‘A Ride From Bude to Boss’ and ‘The First Cornish Mole’) in Footprints of Former Men in Far Cornwall, a collection assembled by Hawker in order to raise funds to support his growing family. 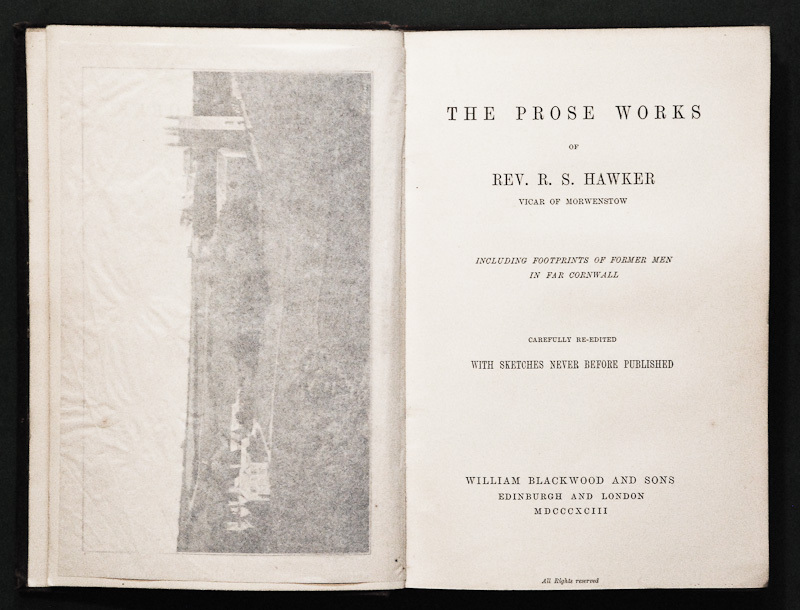 In 1893, eighteen years after Hawker’s death, the collection was reissued by William Blackwood and Sons under the title The Prose Works of Rev. R. S. Hawker, Vicar of Morwenstow, with the addition of two previously unpublished essays, ‘Humphrey Vivian’ and ‘Old Trevarten’. Bibliographical footnotes and a brief Prefatory Note were supplied by Hawker’s friend J. G. Godwin. Hawker’s son-in-law, Charles Edward Byles, edited a new edition published by John Lane in 1903, which appeared in dark brown cloth binding with an embossed panel on the front cover representing a bench end in Morwenstow church, bordered by the vine carving from the church roof. With nineteen illustrations, extensive footnotes, and a generous selection of appendices, this is an attractive item and copies are still relatively easy to find. 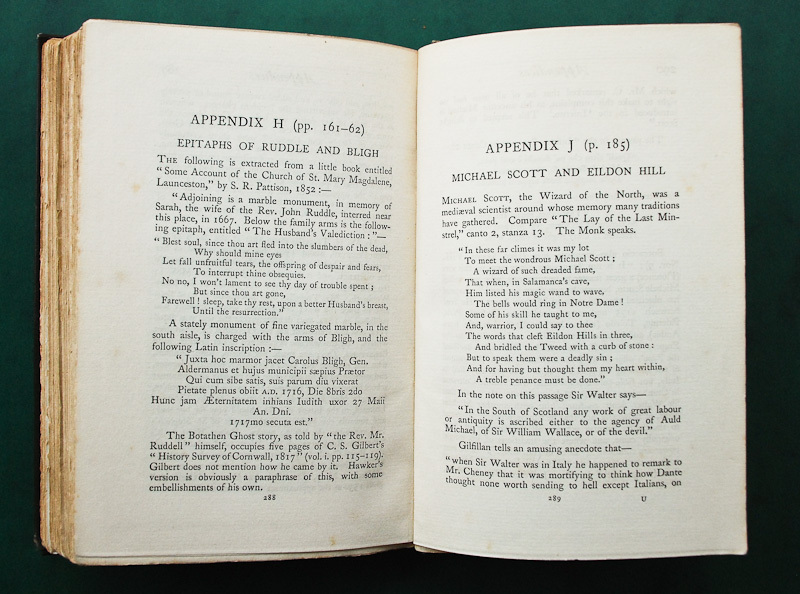 Appendix H and a portrait on p. 160 of “Parson Ruddall” are the first indication that the story may have combined facts with fiction, and Byles’ confident assertion that Hawker’s version is ‘obviously a paraphrase’ of C. S. Gilbert’s Historical Survey of Cornwall ‘with some embellishments of his own’ seems to confirm the source. Byles however didn’t have internet searches to contend with, and it’s hard not to envy him to some extent – at least he managed to complete his book and presumably to satisfy the majority of his readers, who would have been ill-equipped to dispute his conclusions. By contrast, my online searches for ‘The Botathen Ghost’ delivered a tangle of contradictory information that has taken me several weeks to unravel. According to Sabine Baring-Gould, writing in Cornish Characters and Strange Events, the publication by Daniel Defoe in 1720 of ‘A Remarkable Passage of an Apparition, related by the Rev. Dr. Ruddle, of Launceston, in Cornwall, in the year 1665’, was not only the first recorded appearance of the Botathen story but also ‘a genuine narrative written by the hand of John Ruddle himself’. 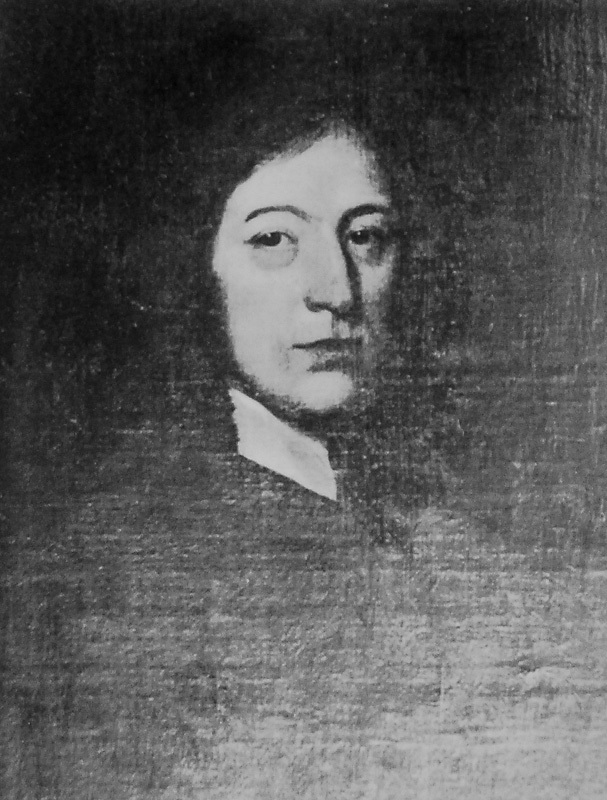 Baring-Gould has some harsh things to say about previous writers on the subject, claiming for instance that ‘Samuel Drew, in his History of Cornwall, blunders as to the locality, making the apparition appear in the parish of Little Petherick, near Padstow’, and that Hawker ‘fabricated a “Diurnall” of Ruddle , which adopted Drew’s error, and by altering the date made the story as given to him disagree with the facts as they stand on record’. Coming from Baring-Gould, himself a prolific publisher of fictions passed off as facts, this is hard to swallow, but he bolsters his case on this occasion by citing his source as ‘Mr Alfred Robbins in the Cornish Magazine, 1898′. Defoe’s “Pacquet” was easy to find online, and Alfred Robbins’ magazine article, included in a book called Launceston Past and Present, turned out to be available from the Internet Archive/Open Library. Many Baring-Gould’s accusations were first made by Alfred Robbins, although Baring-Gould throws in an extra one for good measure, wrongly claiming that Defoe changed the name of ‘the spectrum’ to Mrs Veale. 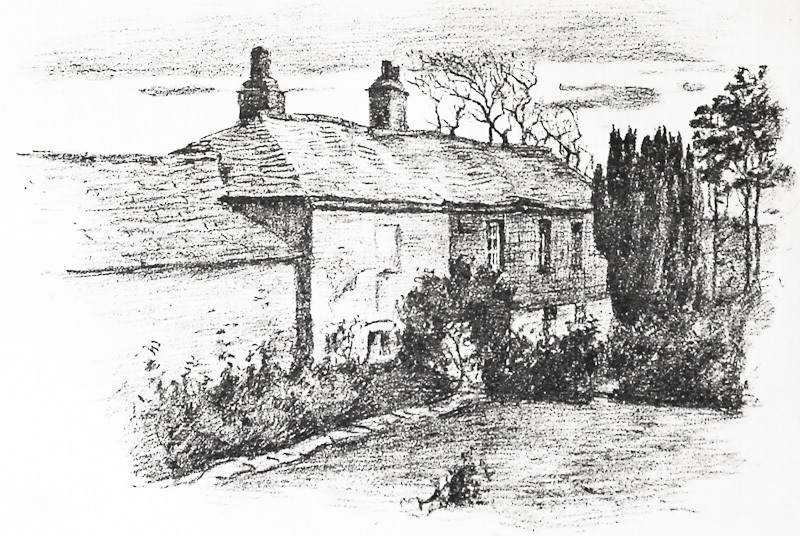 Samuel Drew’s History of Cornwall: from the earliest records and traditions, Vol 2 can be found at Google Books, and pp. 547-551 correctly locate the ghost at South Petherwin, near Launceston, according to the established tradition. Hawker’s version of the story does indeed involve a fabricated diary or ‘Diurnall’ as he calls it – a device which adds considerably to the impact of the story, as do many of his other innovations, none of which involve any alteration to the date at which the events are said to have taken place. As a person who has always found even the best written supernatural tales and folk legends quite hard going I hadn’t paid much attention to Hawker’s various ‘sketches’ until now, but my respect for him as a storyteller has increased considerably as a result of researching this piece and I highly recommend comparing his handling with that of Defoe’s far more basic account. “The Place” of Botathen. Drawn in lithography by Mr. J. Ley Pethybridge. “Parson Ruddall”. From a picture in the possession of Rev. S. Baring-Gould. 1817 – Historical Survey of Cornwall, by C. S. Gilbert. vol i. pp. 115-119. Byles regarded this as Hawker’s source; see Appendix H to Footprints of Former Men in Far Cornwall., p. 288. 1824 – The History of Cornwall, by Hitchins and Drew. 1867 – Hawker’s version of the story appears in All the Year Round. ‘Humphrey Vivian’ and ‘Old Trevarten’ are not included in this rather basic 1948 reissue from Westaway Books of the 1870 edition, but J. C. Trewin’s lively introduction offers a useful insight into Hawker’s literary standing at the time. 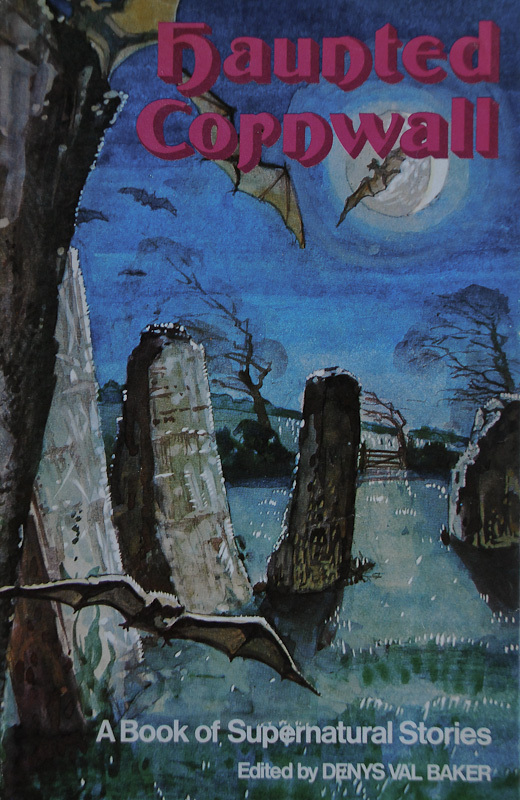 Haunted Cornwall: A Book of Supernatural Stories, edited by Denys Val Baker. William Kimber & Co. Ltd., 1973. 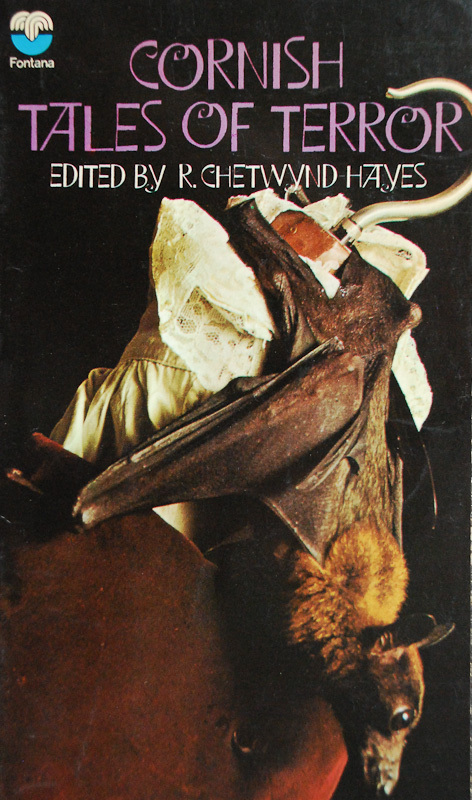 Cornish Tales of Terror, edited by R. Chetwynd-Hayes. Fontana Books, 1974. 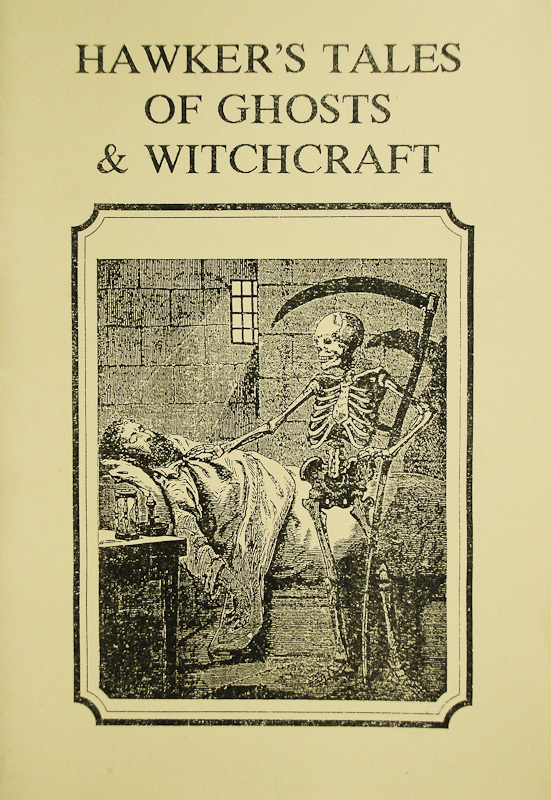 Hawker’s Tales of Ghosts & Witchcraft, by R. S. Hawker. Oakmagic Publications, 1997. 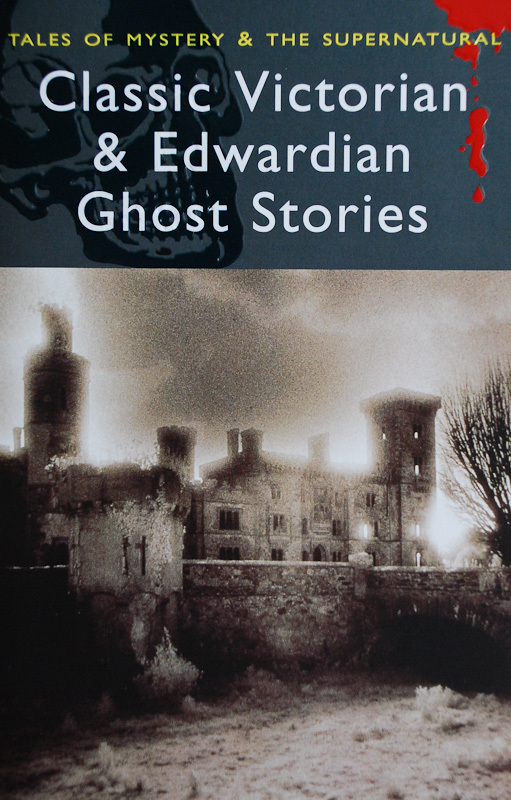 Classic Victorian and Edwardian Ghost Stories, selected by Rex Collings. Wordsworth Editions, 2008.